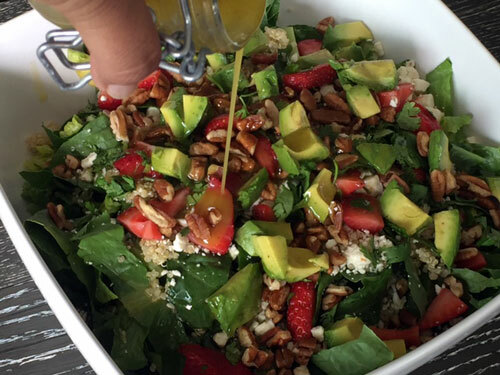 With all those fresh ingredients out there, summer is the best time for salads. I have to say, simple salads are just not for me. I love a salad with all the extras, like nuts and cheese. This is one of my favourite salads. I first had a variation of this salad five years ago at Julie’s potluck. It was a copycat of Earl’s West Coast Salad and had delicious prawns and the most amazing dressing. Since then, I’ve made this salad many times, each time simplifying it a bit more so that I could make it anytime. I use whatever greens I have on hand – romaine, spinach, kale – anything will do. It’s rare that I add the prawns, making it a perfect side salad that goes with anything. I also just use roasted nuts, something I always have on hand. The salad calls for strawberries but I just use what’s in my fridge. The avocado adds the perfect creamy touch. You need to try this salad, I’m sure it will become your favourite too! Combine dressing in a jar and mix well. 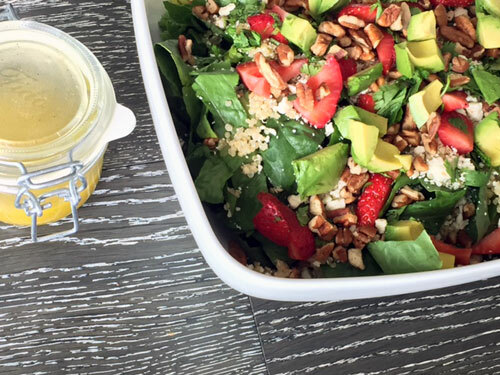 Place all the ingredients for the salad in a bowl and dress with the vinaigrette.